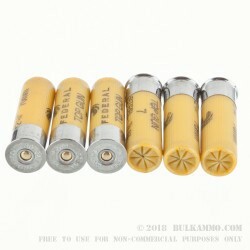 A sporting steel round that utilizes a better build quality to compensate for the lower per pellet weight of the shot and the enhanced performance brings it to “on par” or better than the rounds it seeks to replace. It’s slightly more expensive than the comparable lead, which is to be expected, given the tiny fraction that lead costs compared to steel and the additional wear and tear that production machines will expect to receive based on using the less malleable and harder steel material. 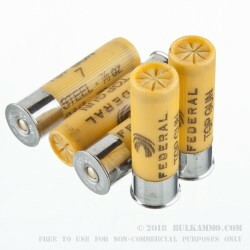 In all, it is still very affordable and the additional performance metrics help to justify the costs, as in many cases, this is a more useful load in steel than it is in lead, given the right understanding of how to shoot your shotgun and the use case you may have for it. Suitable for watershed game work, this may or may not be potent enough for your needs, but the potential still exists for it to be used there. 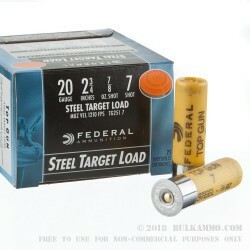 This 2 ¾” shell in 20 gauge with a 7/8 ounce shot cup with #7 shot means it is using a higher size of shot to get less drag on each pellet; while also using a larger payload cup and a higher velocity to ensure you get the same pattern you are used to seeing and the performance you need to take small game and waterfowl and upland birds, as well as standard targets and clays.